Stay as calm as possible – we know this can be hard, but this will also help stop any bleeding as quickly as possible. Try to think positive thoughts. Attempt to place the tooth back into the mouth like it was. Hold the tooth in place by biting gently down on a cloth. Seek professional dental treatment immediately. You can contact any 1st Family Dental location with available service hours to be seen right away. 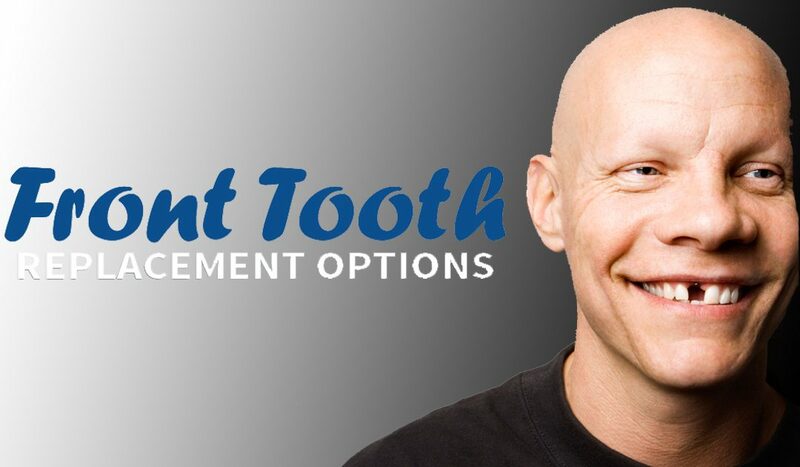 Front Tooth Replacement Options: What are your treatment options if you’ve lost a front tooth? There are many reasons we may be missing a tooth, but missing a front tooth is a special case to a lot of us. Of course, as dental professionals, we know that all teeth are important, but we understand and acknowledge how important front teeth are. They are visible – they are what others see when you smile, and if you have a missing front tooth, any of the front 6 (known to us as numbers 6-11), chances are you want to know your options to replace that tooth, ASAP. Heal the original tooth: This is, of course, the best possible option. Dental implants are the best possible replacement option for a missing front tooth. They are strong, and designed to fuse with surrounding bone (called osseointegration). Dental implants are designed to last for life. A crown is placed over the implant, and if the original tooth is available, an impression is made of that tooth, so that the crown will look and feel like your original tooth. Many of our patients have told us that people who did not know they had lost a front tooth were ever missing one. However, a dental implant may not be possible right away, if healing from the dental trauma is necessary before implant placement. Also, there is an average healing period of about 3 months after implant surgery before a crown can be placed permanently. Never fear – you will not need to go home with a hole where your tooth was. Looking for a Dentist In the City or Suburbs of Chicago? Save Big Dental Implants with This Special Offer! In some cases, you may be eligible to have an implant in a day, with a temporary crown placed over the implant. However, this may not be possible for a missing front tooth that bears a lot of weight and stress of biting and chewing. A Maryland bridge is not a common treatment option, but it is available in the event that the adjacent teeth are healthy. This type of bridge consists of the pontic or crown in the center, and is attached to unprepared teeth by “wings” which are bonded to the teeth. This is also known as a resin-bonded bridge. This option helps to preserve the health of adjacent teeth and looks and feels more natural than a denture, but is not as durable as a fixed bridge or a dental implant. A removable partial denture works the same way as the flipper described above, but is more durable and designed to last for years with good care. A denture, like a bridge, will not replace the absence of the tooth, and it is likely that the other teeth will shift closer together. This may cause gaps and the appearance and even the health of your other teeth.